How can I upgrade Econap? Why is there a red dot on the tray icon? Where can I find the log files? # How can I upgrade Econap? 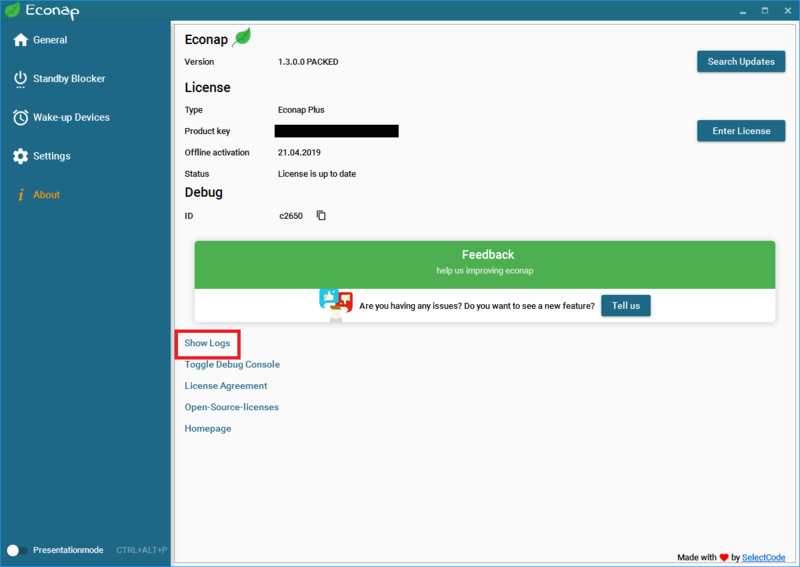 If you want to have an upgrade to Econap Plus, go to the about page and click on “Enter license”. After the validation of the key all plus features will be unlocked. Econap is tray application and mainly operates in the background. You should see a little green leaf (the Econap icon) in your taskbar while Econap is running. You can change your configuration with a right-click at the icon. # Why is there a red dot on the tray icon? The tray icon shows the current status of the system. In other words: If there is a red dot on the green leaf, Econap would not put your PC with the current system load into standby. If you can see the usual green leaf, the PC seems not to be needed at the moment and could be put into standby. If the red dot appears when it should not (or the other way round), your configuration is not optimal. A short look on the standby blockers could solve this problem. # Where can I find the log files? After clicking on "Show Logs", the program folder of Econap opens. In the folder logs you will find all log files for one day at a time. With the file name and the modification date you can easily find out which file contains the current logs. This error only happens from time to time and is caused by .NET when there is a problem with the localisation. The error only happens once and can be fixed by clicking at "Debug". We are currently investigating into this issue and will inform you as soon as this issue is resolved. If you want to use the controller blocker, please make sure that you have installed the DirectX framework. Your version is not up to date: If you're using an outdated version, you won't get PLUS features for security purposes. You're not connected to the internet: Econap needs access to the license server at least all 24 hours.